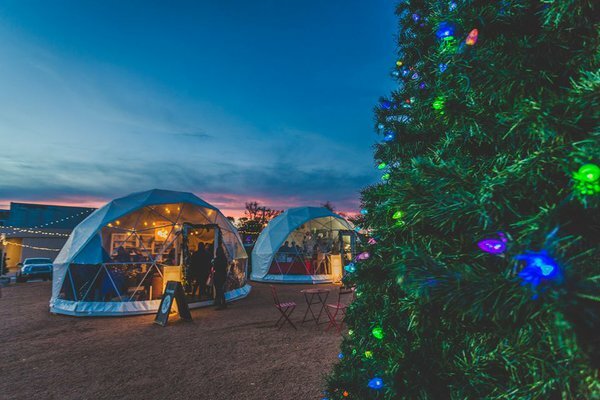 The Holiday Pop-Up Shops in Oklahoma City feature geodesic domes perfect for holiday shopping. Support small businesses while satisfying your loved ones’ holiday wish lists with a trip to some of Oklahoma’s long-running pop-up shops and tourism information centers. Simply explore Oklahoma’s array of small town bazaars and brick and mortar stores offering seasonal stock. Rather than making the trip to an overcrowded mall of stores in the hopes of stumbling upon the perfect gifts, rely on these Oklahoma winter markets to bring the goods to you. These weekend-to-month-long markets provide plenty of time for browsing booths without all the hustle and bustle that comes with more traditional holiday shopping methods. When you’re in the mood for shopping local but don’t have time to trek through town checking out countless shelves, head to the Holiday Pop-Up Shops in Oklahoma City. For five weeks each winter, a handful of local shops will pick a small sampling of their larger inventory to whimsically display inside weatherproof, geodesic domes. Located near downtown, this is the perfect place to seek refuge from the cold after ice skating or checking out nearby lights. After coming across potted plants and home décor to gift, visitors can even take home a Christmas tree from the urban tree lot located outside the domes. Around 70 local artists showcase their work just in time for the holiday season at the Deluxe Winter Market in Oklahoma City. Find gifts for all here, like novelty Christmas stockings and wooden ornaments seamstresses and crafters have created by hand. Artisans also offer a variety of goods for the ladies, from one-of-a-kind graphic makeup bags to handmade candles. For the men in your life, check out the selection of printed Oklahoma tees or handmade longboards. Kids can also secretly shop for their loved ones in the Young at Art Mart with the help of volunteers. For a truly unique holiday shopping experience, head to the Pambe Ghana Global Market in Oklahoma City. All goods for sale here are fair trade items crafted internationally from as far away as Africa. Musicians in the family will appreciate an African drum, while kids are bound to love stuffed fair trade frogs. Visitors can stock up on mittens knitted in Nepal, wooden puzzles crafted in India or Peruvian Nativity sets at this global market in the heart of the city. From fragrant felted soaps to detailed animal kites, this global market has some of the most unusual, hard-to-find gifts across Oklahoma. Celebrate the holiday season with a festive, Bavarian shopping experience in Tulsa. At Christkindlmarkt, snack on a schnitzel sandwich or slice of apfelstrudel before heading into the main vendor area for some handmade crafts. Regal nutcrackers and imported ornaments line the tables, waiting for someone to take them home for décor purposes. Kids can listen to Christmas stories, make their own crafts and meet St. Nikolaus. Browse through baked goods to stuff in stockings or discover beer steins and teddy bears to wrap. The Tulsa Holiday Market curates more than 100 vendors selling locally made goods as well as unique products from around the country. With a trip to this three-day holiday market, visitors are bound to secure gifts for plenty of people on their seasonal shopping lists. Grab a few gourmet pickle relishes and hearty cheddar bacon dip mixes for the foodies in your life, or pick out sparkling necklaces and handstitched cowboy boots for the ladies. The kids will enjoy unwrapping children’s books and stuffed rabbits, while that special someone will appreciate luxurious Egyptian cotton sheets and handmade bath products. Get in the holiday spirit with a trip to the Castle of Muskogee for Castle Christmas. The medieval holiday gift shop offers plenty of goods from local vendors as well as the opportunity to create your own candles and sand art. From tooled leather products to goat milk soaps, guests are sure to come across rare finds. Loved ones may also appreciate a handcrafted piece of wire-wrapped jewelry or handstitched stockings with their names embroidered on top. Kids are also sure to love choosing and stuffing their own animal toy on site. Come for the food, lights and Father Christmas photos and leave with a car filled with fun finds. For one day only, these various Oklahoma craft shows and bazaars will offer visitors unique handmade goods and direct vendor sale products to take home and wrap. Take a trip to smaller Oklahoma towns for a relaxing experience picking out merchandise like cosmetics or upcycled furniture sure to be a hit with your loved ones. More than 90 vendors will offer crafts and home décor goods at The Santa Market in Edmond. Some vendors will even make customized creations like personalized children’s books on site. Handmade treasures are the specialty at the Holiday Craft Show in Stillwater. More than 100 vendors will offer vintage items and handcrafted jewelry at this booming holiday shopping experience. Shop local while picking out gifts at the Mustang Christmas Bazaar. Shoppers are sure to come across plenty of handstitched blankets, baked goods and handmade holiday crafts here. Support small businesses while browsing through holiday wreaths and pottery at the Christmas Holiday Market in Poteau. Shoppers are sure to find plenty of artisanal goods like wooden bowls and drums. Check off many a holiday gift list item at Santa’s Village & Holiday Bazaar in Watonga. With more than 60 vendor booths available, searching for the perfect craft to give will be a cinch. From vintage furniture to metal art, stock up on seasonal gifts at Winterfest Craft Show in Kingfisher. After shoppers make their initial selections, they can refuel with a cup of chicken and noodles. Explore the Christmas Market Oklahoma Festival in Ponca City for a winter wonderland packed with Native American goods and Christmas cheer. While you shop, enjoy the carolers and twinkling lights. The Holiday Arts & Crafts Show in Bixby supplies a vast array of last-minute holiday gifts for holiday shoppers. Products range from honey candles and wooden pens to glass art and barbecue sauces. For one-of-a-kind holiday shopping in Oklahoma, look no further than the Native American Christmas Market in Sapulpa, featuring Seminole patchwork skirts, beadwork, paintings and turquoise jewelry. Those who prefer more classic shopping routines can still select one-of-a-kind holiday products by visiting some of Oklahoma’s specialty shops. Enjoy the personal attention from local shop owners while grabbing Made in Oklahoma gourmet foods, seasonal decorations and regionally crafted clothing. Northwest Oklahoma features antique stores and small shops hidden among the high plains. Venture to Ootsie’s Blossoms & Boutique in Fairview for Oklahoma-made popcorn, spice blends and decorative pillows. Shoppers will also find Sooner state hats and hand-printed tea towels with fun phrases like, “I’ve never been to heaven but I’ve been to Oklahoma.” Drive northwest to The Felt Bird in Enid for city pride coffee mugs and screen-printed Wheat Capital tees. This family-run shop also sells Oklahoma-themed baby clothes and state-shaped earrings. Culture-rich Northeast Oklahoma contains plenty of gift shops and local stores tucked along Route 66. Antique NV in Jenks breaks out its holiday china, wall hangings and lawn decorations among its typical vintage furniture options and sometimes sells unique seasonal clothing (including elf costumes). Further west, find house-made scented soaps and beard oils next to locally crafted soy candles and state-themed coasters at 1907 in Broken Arrow’s Rose District. Trek northwest along the Mother Road and come across Blue Whale towels, buffalo graphic tees, Tulsa-made vegan sea salt scrubs and Oklahoma dinner plates at Barn 66 in Catoosa. Up north in Claremore, Belvidere Mansion offers seasonal wreaths, knitted ornaments and nutcrackers alongside its precious porcelain tea sets. Enjoy the personal attention from local shop owners while grabbing Made in Oklahoma gourmet foods, seasonal decorations and regionally crafted clothing. Head to the center of the state and discover seasonal stock within the Central Oklahoma short-grass prairies. Up-cycled goods run rampant at The Old Store in Piedmont, which also includes a local clothing section, state-shaped wall art and hand-painted holiday chairs. Visit the Museum Store Holiday Open House at National Cowboy & Western Heritage Museum in Oklahoma City for locally-made Western gifts like decorated Native American gourds, hand-carved antler letter openers, leather purses and pinched pots. Tour through North Pole City in Oklahoma City for holiday decorations ranging from bells and bows to twinkle lights and decorative Santas. Located a few miles south, The General Store in Moore specializes in Made in Oklahoma foods like fine chocolates, fruit spreads, seasoned nut mixes and pork rinds. Situated near historic sites, Southern shops in Southwest Oklahoma sell a diverse range of handcrafted goods. Explore hand painted tote bags and decorative globes while browsing through options at Miller Collective in Sayre. Shoppers can also come away with tepee wall hangings and crocheted dinosaurs inside this rustic specialty shop. Down south, Prairie Rose Gifts & Boutique in Duncan presents everything from women's clothing and trendy jewelry to Oklahoma-themed tees and Oklahoma-inspired gifts. Look past all the flowing lakes and waterfalls in South Central Oklahoma and you’re bound to come across numerous small businesses with locally-made products. At Main Street Mercantile in Pauls Valley, make your selection from the handcrafted sugar sprinkles, hot sauces, roasted coffee beans and buffalo makeup pouches hailing from Oklahoma vendors. A short drive south, Okie Twister Co in Sulphur provides countless shelves’ worth of Made in Oklahoma goods like Frankoma pottery, handmade Chickasaw jewelry, country-style crafts and tasty sweets concocted regionally. Beneath the picturesque mountains in Southeast Oklahoma lie an abundance of local shops with local treats. At Three Rivers Pecans, Fudge Factory & Amish Store in Calera, visitors will come across Amish cheeses, fresh baked bread, homemade fudge, local honey, soup mixes and jars of cider. Over in Quinton, shoppers can peruse the delicious jars of food finds at Apple Hollow, from house-made pepper patch salsa and peach preserves to pickled asparagus and green pepper jelly. Next time you drive into Oklahoma during a vacation or road trip, be sure to take a look at seasonal souvenirs found at our many Tourism Information Centers, perfect for commemorating your visit. Stop by the Erick Tourism Information Center or Sallisaw Tourism Information Center in the Sooner State for your chance at landing state-themed ornaments decorated with familiar attractions like the Golden Driller or the Blue Whale. While you sip free fresh coffee at the Oklahoma City Tourism Information Center, arrange a custom gift basket of Made in Oklahoma jams, dip mixes and other food products available. Oklahoma-themed stuffed animals from the State Capitol Tourism Information Center are great for the kids, while state-shaped chocolate is the best bet for a sweet stocking stuffer. Friends may even appreciate Oklahoma pillows and towels or a souvenir set of cups found at the Blackwell Tourism Information Center. Merchandise varies by location, so call ahead to ensure each travel center has these local gifts in stock.